Shrinking your Arduino projects saves you money and space! Here I show step by step how to program an ATtiny85 chip. Today, we are going to build a circuit to program an ATtiny85 with our Arduino. 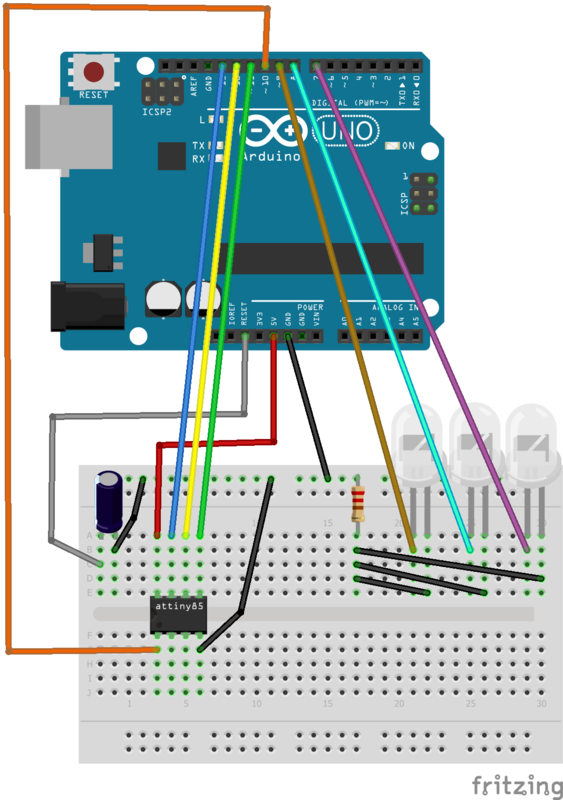 Before we start with the circuit build, head over to the Arduino IDE. The Arduino software does not natively support the ATtiny85 so we need to add support for it. Open the Preferences Dialog from the File menu. Put the link into the "Additional Boards Manager URL". Note that you will require an internet connection for the ATtiny board manager to download. Search for ATtiny, either manually scrolling down the list, or typing "attiny" in the filter field. Click Install the (Use the latest version). Lets set up the program to use the Arduino as a programmer. 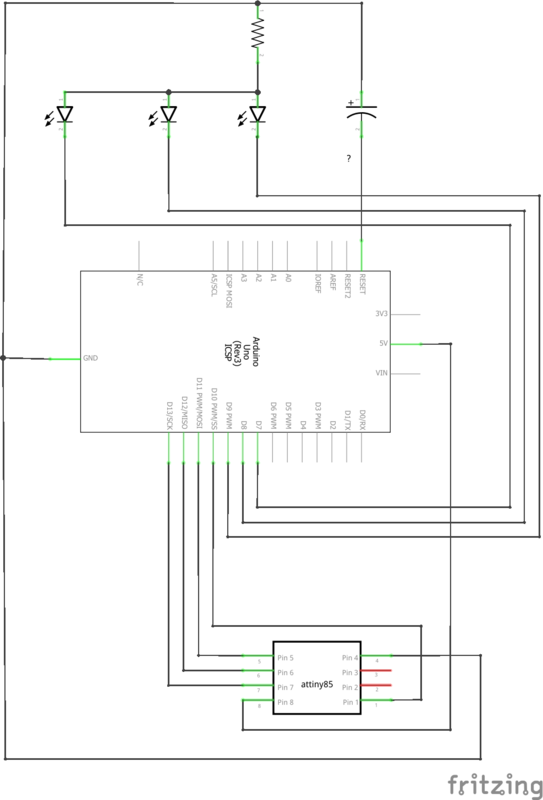 The chip has 8 pins, to program the ATtiny85 we are interested only 6 of them MISO, MOSI, SCK, RESET, Ground, and Positive. If you look closely at the chip you will see a dot. This is Pin 1. Pin 2 through 8 follow in an anti-clockwise order around the chip. Conveniently the headers on the Arduino are easy to work with to program the ATtiny85. The programmer will now work, but I'm going to add some LED's because LED's are fun to have. Connect the 330k resistor to ground and a terminal strip. Connect Arduino pins 7, 8 and 9 to separate terminal strips. Place LED's between each of the terminal strips (connected to 7, 8 and 9) and to the terminal strip with the 330k Resistor. Head back over to the Arduino IDE. First we need to burn the Bootloader to the chip. Select Burn Bootloader from the Tools Menu. Once that is done, you can upload Arduino Sketches to the ATtiny chip, as if it were an Arduino. Just remember the limitations to the ATtiny chip and any program within the limitations will work. I like stuff, from building rockets to elctronics. Thanks to Randall Bohn and David A. Mellis.